Below is a letter from Corvallis High School Spartan Robotics – FRC Team 997 requesting donations to help the team get to St. Louis for the World Championships for which they qualified by competing in two district and one regional event. I wanted to give you a parent’s perspective of why this is important. 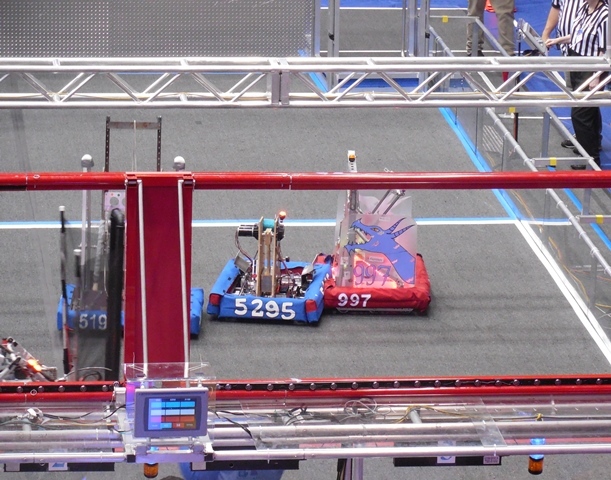 FRC Robotics doesn’t emphasize competition the way athletics generally do. In fact, extra points are assigned in any given event for cooperating. STEM outreach is an important goal of FRC and Corvallis Spartan Robotics does everything they can on a very tight budget, including going to elementary schools to demonstrate science and putting up instructional videos on YouTube. An award is given for gracious professionalism–an award that Corvallis Spartan Robotics FRC Team 997 has won, in large part due to their willingness to reach out and help other teams through lending tools between matches, showing them around unfamiliar territory, and even feeding a Rookie team at the local district event. Girls and guys alike learn science, engineering, animation, graphic design, and other business skills in a supportive environment with mentors, but the students do the work. Corvallis Spartan Robotics is particularly inclusive with a high rate of girls (37%) on the team, as well as students with disabilities. And they go out of their way to make sure that everyone, no matter their income, is an essential part of the team with all of the same learning opportunities as everyone else. So why does going to World’s matter? Because these kids will have the chance to see Scholarship Alley–a section with the top STEM schools in the country–and to network with some amazing minds in the field. FRC is sponsored by NASA. One of CHS’s own former robotics’ students worked on the Mars rover. One of our students is nominated for Dean’s List–an award for students who show extreme leadership qualities in the area of STEM, both on their team and in their communities. If he wins, it will mean a scholarship. As is, it’s a wonderful recognition and demonstrates the kind of inclusive, student-centered leadership that our own team coach and mentors model. You can see more of what this team has done by visiting their webpage. Team 997 playing defense in a match at the Oregon State University district tournament 2014. While they will be going to a competition, and will certainly put their all into the competition, the experience is not about competition. It’s about learning. They get this opportunity about every 5 years, so for a large part of the team, this is their only chance. The new district system created more expenses than the old system, so while sending the students is a tremendous opportunity, it’s also an expensive one that is creating the need to ask for more funds than usual. I’ll be helping the team put together a solid, and hopefully sustainable, fundraising plan over the next few months, but we need to get them to St. Louis in a little less than a week. The total cost for the trip is around $25,000 with registration fees–and every student gets to go even though we are a large team with a lot of working class members. My daughter has a job and is paying $200 of her own money and paying back money that others’ are lending her so that she can go. It means that much to her. So it means that much to me. I want to note that our other local high school also qualified, but it’s my understanding that they have enough money to send the students they’ve chosen to send to St. Louis and won’t be fundraising. I’m not forgetting them! We’re very proud of CVHS Robotics FRC Team 955, too! If you’ve read enough and want to donate now, you can head over to Corvallis Public Schools Foundation to make a donation by credit card. Please designate your donation “Spartan Robotics Team 997” and remember that every little bit helps. If you need more info, please read the student-written letter I’ve included below. We are Corvallis High School Spartan Robotics – FRC Team 997 and are reaching out to you for a donation to support our team in the FIRST Robotics Competition (FRC) World Championship in St. Louis, Missouri that is occurring April 23-26, 2014. FIRST is an organization founded by Dean Kamen to “inspire young people to be science and technology leaders by engaging them in exciting mentor-based programs that build science, engineering and technology skills, that inspire innovation, and that foster well-rounded life capabilities including self-confidence, communication, and leadership”. There are multiple competitions and leagues that make up the entirety of FIRST. FRC, considered the “varsity sport of the mind,” focuses on the design, test and building of robots for competitive play at competitions, but also prepares high school students essential skills for use later on in life. Through this program, students gain leadership, communication, social, fiscal, and cooperative skills as well as technical design – electrical, mechanical, programming, and design integration. For more information on FIRST and FRC, please check their website at http://www.usfirst.org. We are one of four teams in Oregon that have qualified for the FIRST World Championship and are currently fundraising to provide our team with enough money to participate. It is a rare opportunity that will enrich and expand our understanding and involvement in STEM- related fields to pursue in the future (STEM: Science, Technology, Engineering, and Math). During this competition, 400 FRC teams will gather to showcase their skills in engineering and innovation, and will be given the chance to talk to engineering companies such as Boeing and Autodesk. With your donation to Team 997, you will be helping an aspiring group of students compete on a global scale and help out students that otherwise would not be able to go. Your donation would be tax deductible, and help us reach our goal. Thank you for taking time to read this letter, and we hope you will consider donating to the team.  Send a check to Corvallis High School with Spartan Robotics in the memo area. Spartan Robotics. The Schools Foundation is a registered 501(c) 3 with the IRS and State of Oregon. All donations are tax deductible.